Unlike many people, I wasn't glued to the television during the Olympic games, though I enjoyed watching synchronized diving (who thought that one up? ), the amazing gymnasts and am really looking forward to the closing ceremony performances. I suppose the Olympics of baking has traditionally been the Pillsbury Bake-Off, but these days the sport is played out daily on all those competitive baking shows on television. But I digress. 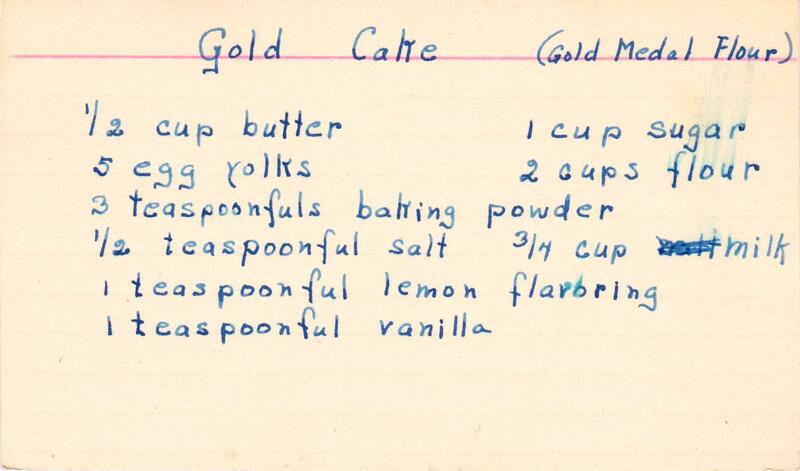 This gold cake -- and there are many, many recipes for gold cake -- is really good. The difficulty level is a 2.1 and the judges would surely give it a 9.5. This is the perfect cake to make with all the egg yolks left over from that "virtuous" (no-fat) angel food cake you baked, or the more old-fashioned silver cake. I decided to make cupcakes instead of a layer cake, and a limited edition (just half the batter) so I used three instead of the five egg yolks called for. In baking, it's always best to round up. Like most old fashioned cakes, this is simple. And like many recipes in my collection, this was simply a list of ingredients. I wrote out the method below. The challenge with cupcakes is knowing how much batter to put in each cup. It's probably better to under-fill rather than overfill because you can make up the difference with frosting. For the frosting, I chose Fresh Lemon Icing from the very first recipe box I bought many years ago. It's a cooked frosting and difficult to make (leading me to ponder who thought that up?). It involves standing over a hot stove, which is probably why I waited so many years to try it (but doesn't explain why I tried it when it was 95 degrees and 95 percent humidity). I used an electric hand mixer, but the recipe calls for a rotary beater. I have a collection of these, and do enjoy their steampunk quality, but I truly can't imagine making this frosting using this old-fashioned contraption. It took me 15 minutes aided by electricity; it would take double or triple that without. Note (to continue the Olympic theme) that the recipe calls for Gold Medal Flour! Though I much prefer Daisy Flour or, when I can't get Daisy, then King Arthur. Preheat oven to 350 degrees. Grease and flour two 8 inch cake pans. Add egg yolks, one at time, combining well. Combine four, baking powder and salt in a bowl. Add the dry mixture to the butter sugar alternately with the milk, beginning and ending with the flour mixture. Pour into pans (or cupcake tins). Frost with Fresh Lemon Icing or your favorite frosting. 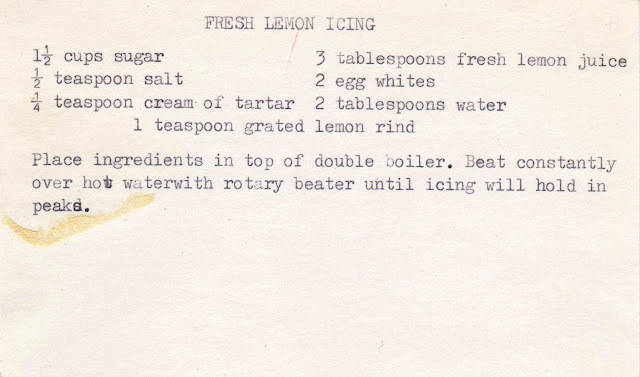 Classic 7 minute frosting with some lemon in it. I've made it loads of times & it does in fact take 7 minutes from start to finish. With cupcakes I usually dip them in the frosting to form a little peak & let them air dry. 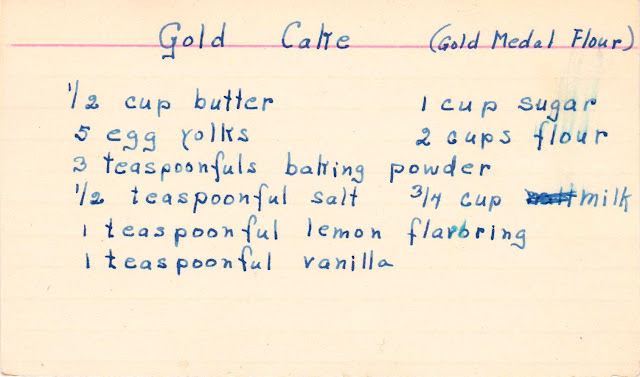 Never made 'gold cake' but might try your recipe when I have leftover yolks. Thanks. Yes, I was thinking it was 7 minute frosting until I passed the 10-minute mark! Perhaps the heat and/or humidity affected it adversely. And do try this gold cake (or the other one on my blog, which is even better)! Thanks for writing.